Hey, what can I tell you...I am perhaps one of the few training professionals who has largely ignored the field of emotional intelligence as a means for developing people in organizations. I did read Goleman's book many years ago, before I was in training. I remember it being smart and interesting, but I remember reading it as an intellectual (define irony) exercise...and then I moved on. I just didn't see it. But I saw this tweet the other day that got me interested, and I didn't even know it was happening. If you had asked me 20 minutes before I saw this tweet, I would have said that was not for me...mindfulness is hippie talk or weird spiritual Chinese philosophy stuff (my wife is Chinese and IS into this stuff). But like I do from time to time, I try something new and outside of myself. So I got the book, Search Inside Yourself: The Unexpected Path to Achieving Success, Happiness (and World Peace). 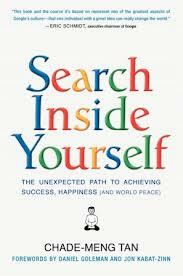 The author, Chade-Meng Tan is an introverted engineer, turned trainer at Google who developed a curriculum on emotional intelligence and called it (of course) Search Inside Yourself. Intelligent, analytical engineers who hate this stuff, now love this stuff and say it has changed their lives...at work and at home. I just got the book today and have read through two chapters, and I already want to implement emotional intelligence training. So for all you training professionals out there tasked with figuring out how to develop people in your organizations to be more effective, I suggest you get this book. I am glad I did. If you are not hooked after reading the Introduction (I bet you can get a free sample on your Kindle), there is no hope for you.